Across the Houston area, many people choose to use their motorcycle as the primary form of transportation. But unlike more rural roads, Houston roadways can be very dangerous with road hazards. Keeping riders safe in a busy urban environment can be especially challenging. Common types of motorcycle accidents occur by making a left turn, lane splitting, dangerous intersections, traffic accidents, rear-end collisions and negligence. In an effort to understand driving hazards and make roadways safer, the Federal Department of Transportation and the Texas Department of Transportation (TxDOT), keep track of statistics relating to car accidents, motorcycle accidents, and other types of vehicle accidents. Although not surprising to a personal injury attorney, the statistics make it quite clear how deadly motorcycle collisions in Houston can be. Hundreds of people are injured and die each year due to motorcycle accidents. Even so, motorcycles and scooters are increasing popularity due to their low cost of ownership and use. This increase in riders also comes with an increase in the number of motorcycle accident injuries and fatalities. In an effort to combat these rising number of collisions, the TxDOT has been running advertisements to help drivers understand the impact of motorcycle accidents in Texas. 501 motorcycle riders were killed last year (470 were operating the bike and 31 were passengers). 52% of bikers killed were not wearing their helmet. There were 2,101 motorcycle accidents with suspected serious injuries. Motorcycles make up approximately 2% of vehicles on Texas roadways, but motorcycle deaths account for 13.46% of the number of deaths. While there was a decrease in the number of deaths on Texas roadways last year, the number of motorcycle deaths actually increased. When riding a motorcycle it is important to practice motorcycle safety and wear all recommended protective gear. The high risk of injury associated with motorcycles comes from the lack of protection their vehicle offers them. A motor vehicle provide drivers with a shell of protection as well as other safety measures like airbags and seatbelts, helping reduce the seriousness of injuries. Motorcycles lack all those safety features, as well as being much smaller than the vehicles that hit them. This scenario often leads minor injuries like road rash to spinal cord injuries, brain injuries or sometimes deadly injuries for motorcyclists. A common cause of accidents in the Houston area is drinking and driving. It is no surprise that 44% of all fatal motorcycle accidents involved alcohol. To ride a motorcycle is different than operating a car. While all drivers must be careful and aware of their surroundings, bikers must use a heighten the sense of awareness because of the significant risk that other drivers pose them. When you drink and ride, your senses impaired and your ability to perceive and react is reduced. When impaired drivers take to the roads, they’re not just endangering themselves, but everyone else in their path. Often, motorcyclists must fight for their fair share of the road – even without worrying about drunk motorists. In some cases, a motorcycle passenger may not be aware that their rider has been drinking. This could lead to a terrifying situation that may result in a crash with serious injuries with costly damage. Now what if you were involved in a motorcycle accident, what steps should you take next to ensure your health and damages are taken care of? Immediately after, it is important that you seek proper medical care if you’ve been injured and to ensure you do not have any hidden injuries. You also need to be sure to document everything. Although most of the time accident injury victims have access to medical care, they are often left with incredibly expensive medical bills that can lead to bankruptcy or a lifetime of payments. That is why it is crucial that accident victims document all of their injuries and medical treatments in the event of an insurance claim or an injury lawsuit is filed. After involvement in a motorcycle accident, both your insurance company and the at-fault driver’s insurance company will attempt to contact you to get a statement about the crash. It is important to be careful with what you say to the representative after an accident. The reason it is important to speak cautiously because it can affect your claim. The goal of the at-fault driver’s insurer is for you to make a statement that will end up lowering the value of your claim. Depending on what is said, it can be difficult to get fair compensation after saying the wrong thing to choose your words carefully when dealing with an insurance representative. Once aware of your potential risks, you should speak with an experienced motorcycle accident lawyer familiar with injury cases to determine if there is an opportunity to receive compensation. Discuss what occurred, how you were injured, and your claim. The best thing that a person can do to protect their legal rights after being in a motorcycle accident is to contact an experienced injury attorney and follow their advice. A lawyer understands the accident claims process and how the law may affect your accident case. An experienced lawyer will be able to protect your legal rights and compensation. They will attempt to gain maximum compensation for property damage, pain and suffering, medical expenses and lost wages. Remember, most personal injury lawyers work on a contingency fee basis, meaning that they do not collect any fees unless they win your case. There is an important concept under Texas personal injury law called the “51% bar rule.” Texas courts apply what is known as a “modified comparative fault” rule to negligence claims. If the driver is partially responsible for the accident, the amount of compensation will be reduced by a percentage proportionate to the at-fault driver. However, the driver cannot recover any damages if he or she were more than 51 percent responsible for the accident. This means that even if the rider was badly injured, he or she may be prevented from receiving any money if injured. 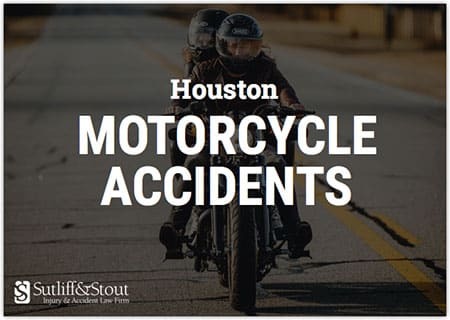 Houston motorcycle accidents are more common than you think. So where do you begin when looking for a personal injury lawyer? At Sutliff & Stout Injury & Accident Law Firm, we will be more than happy to assist in any motorcycle injury accidents you or a loved one may have been involved in. We believe in gaining financial compensation for our clients who have been involved in an accident as a victim. Medical bills and property damage that may be done to your vehicle in the case of a motorcycle accident can become quite costly so speak with us today. Call (713) 978 – 7111 or swing by our office located on 550 Post Oak Blvd. #530 Houston, TX 77027 (directions).